She's A Man-Eater, And That's OK With Male Orb-Weaving Spiders : The Two-Way Usually in nature, the females choose the males they mate with. But researchers say a type of male orb-weaving spider selects the female — which will cannibalize him afterward. Cyrtophora citricola, a type of orb-weaving spider, live in big colonies. So males potentially have a large pool of females from which to choose a mate. Usually in nature, it's the females who survey the males and make their selection. But when biologist Eric Yip was working at Ben-Gurion University of the Negev in Israel, he and some colleagues wondered if that held true for Cyrtophora citricola, a kind of orb-weaving spider native to the Mediterranean. Two things made them think these males might be choosy. First, they have just one shot to mate and they have to make it count. That's because researcher Na'ama Berner-Aharon recently found that this species has a very high rate of sexual cannibalism — 100 percent of males that successfully mate get eaten by the female. Second, this species lives in colonies of hundreds or even thousands of spiders. That means males can potentially encounter multiple females, unlike more solitary spiders that have to wander around and possibly get killed before they find a single mating partner. To see if these male spiders were picky and, if so, what they looked for in a female, the researchers did a series of careful experiments. It turns out that, indeed, the males won't mate with just anyone. 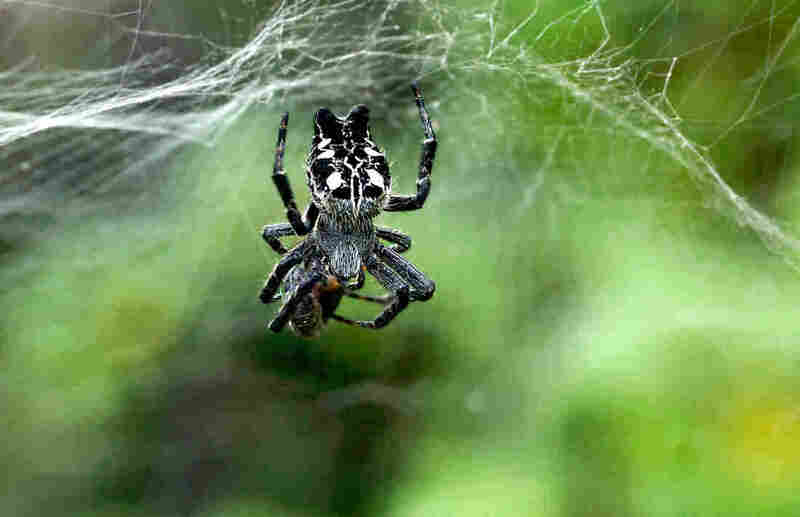 "We had a lot of males that just sat in the females' webs for days and days and days and never copulated," says Yip, now at Pennsylvania State University. "She was an adult female, ready to go, a virgin — and the male just had no interest." The males would wait for a gal with certain key traits. "The ideal female is a very well-fed, recently molted female to adulthood," Yip says. "So she's got a lot of resources for eggs, she's a virgin so he may not have any competition for those eggs with other male sperm, and she's young, so she hasn't expended any of these resources that she's gathered throughout her juvenile life." The males also preferred female spiders that had been raised on a feeding regimen that gave them lots of extra food. Yip says that's probably because well-fed females produce more eggs — not because the males were hoping she wouldn't be hungry enough to eat them. "Females on the high and low feeding regimes were equally likely to cannibalize their males," he explains. "Therefore, preference for well-fed females cannot be explained by a male sense of self-preservation." Older males spiders, however, were less choosy, presumably because they were running out of time to do the deed. One thing the researchers noticed was that females often would begin plucking their webs and initiating courtship before the males did. "And that was really interesting because it's not very common for that to happen," Yip says. "Maybe the females are actually having to compete or advertise to the males to get mating opportunities." The researchers describe their work in the journal PLOS One. "I thought this paper was really interesting because there are only a few people who have studied cannibalism and choice in the context of a social spider," says Maydianne Andrade an evolutionary ecologist at the University of Toronto. "The male kind of has a smorgasbord of females to choose from, potentially." She says because cannibalism is so high in this species, "it's a really high-stakes decision for that male, and has all these options to choose from." But it's still unclear, in these orb-weaving spiders, how complicit the males are in their own demise. Females of many spider species will attack males right after copulation. "The female needs sperm, but after copulation, she has no use for the male," Yip says. "There's no reason not to eat him, really. He's a nice calorie-rich meal for her." While some male spiders try to get away, the males of other species seem to actively court death. Australian redback males, for example, actually twist their bodies around and somersault into the mouth of their mate. This is because males that sacrifice themselves seem to produce more offspring. They can feed a female so she is more successful in producing young, and perhaps copulate for a longer period of time and transfer more sperm. "If these males have been selected to do this over time, I would actually predict that they enjoy it," Andrade says. "They're just completely different from us. None of our assumptions apply."